Home / TALK OF THE TOWN / THE PROGRAM: The Rise and fall of the seven times Tour de France champion Lance Armstrong. THE PROGRAM: The Rise and fall of the seven times Tour de France champion Lance Armstrong. 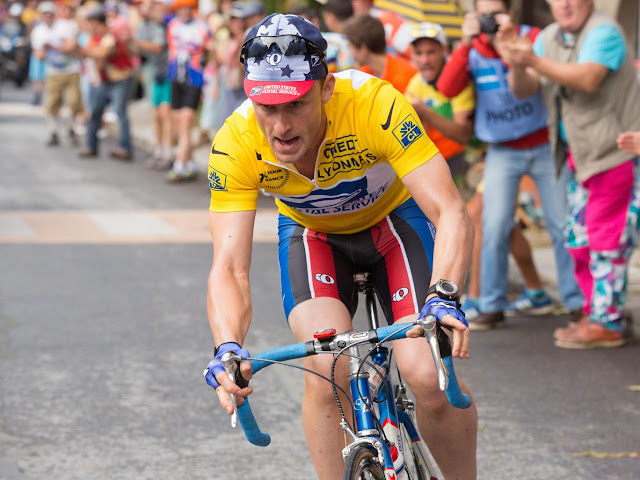 It is 1993 and 21 year old Lance Armstrong (Ben Foster) is making his debut in the Tour De France. The Sunday Times journalist, David Walsh (Chris O’Dowd) interviews the young Lance over a game of table football. Lance is determined and hugely self-confident, as well as extremely competitive. Chatting with his press colleagues afterwards, David tells them how cocky Lance was. When they ask if he is a contender, David says he absolutely is – in the one day classic races. On the starting line at a Belgian one day race, Johan Bruyneel (Denis Menochet) tells the young upstart Lance that he will never win as others have more red cells in their blood – they are doping. The race plays out as Bruyneel predicted. Meanwhile in a lecture hall, Dr Michele Ferrari (Guillaume Canet) is learning about trials of the drug EPO. During the race, Lance watches hopelessly as three members of one team drop everybody else and easily finish in the top three places. At the lecture, Ferrari asks about the use of EPO in sport, but is told that would be unethical. Ferrari shrugs. At the Belgian race press conference, Ferrari is on stage with the winners, a member of their team. Questioned as to problems with the use of EPO, he once again dismisses all concerns. Lance tries to convince his hesitant teammate Frankie Andreu (Edward Hogg) that they have to use EPO to be in with a chance. 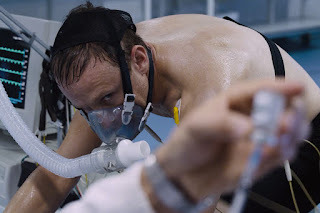 Lance approaches Ferrari and tells him he wants to join his “program”, but the doctor dismisses him telling him that he doesn’t have the right physique to be a good climber. Lance buys EPO for his team at a pharmacy in Switzerland. A year later, back at the Belgian one day classic, it is now Lance dropping the peloton and winning the race by a huge margin. However after the celebrations, Lance starts to cough up blood. His doctor diagnoses testicular cancer, at the third, and final, stage. Treatment begins and Lance is subjected to gruelling rounds of surgery and chemotherapy. He pushes himself even when at his lowest and tries to walk down the hospital corridor, but collapses into a wheelchair. As he recovers, Frankie and his wife Betsy (Elaine Cassidy) visit Lance in hospital. A doctor arrives for a consultation, and Lance tells his friends to stay. Lance makes a slow but determined recovery. He travels to Ferrara, Italy, to the home of Dr Ferrari. Through his illness, he has lost the weight required of him and Ferrari is convinced enough by his will to win to take him on. 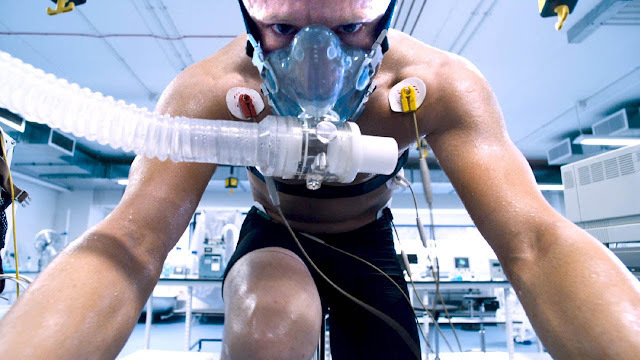 He subjects Lance to a huge range of tests, analysis and training exercises so that he is no longer ‘confined by the limits of his physiology’ and Lance reaches peak fitness, getting to grips with some of the substances and doping methods which would propel his career forward along the way. During this time, the so-called ‘Festina affair’ has erupted after a team soigneur has been caught with performance enhancing drugs. This has led to police raids across the Tour and the discovery that drug use is rife. Ferrari and Armstrong laugh at them for getting caught. Lance brings Bruyneel on board as director, explaining that following his illness the only team that would take him are the very minor US Postal team. Bruyneel says that they have to go out to win, and Lance says that after his cancer he never wants to come so close to losing again. Lance, Bruyneel and Ferrari head up the team’s rigorous training programme, at altitude. Lance reunites with agent Bill Stapleton (Lee Pace) who had spotted Lance’s commercial potential before he got sick. Bill now sees an ever more potent story, especially when Lance passionately announces that he wants to start a cancer charity. It is 1999. David in his press car banters about whether this year really is to be rebranded the Tour of Renewal, after last year’s drugs farce. They say that Armstrong has risen from the dead and as an early supporter David says that he really thinks Lance can win a stage. There is jubilation when Lance does win the opening stage. David writes about the ensuing mountain stage. Wearing the winner’s yellow jersey, Lance starts to attack on the Galibier climb; he breaks away with tremendous power leaving the peloton far below. There is excitement in the press room. David alone is silent. Lance reaches the finish in Sestriere way ahead of the peloton. His previous best in the mountains was 39th. David reminds his colleagues about last year’s doping scandal and that the speeds have gone up this year, but they don’t listen. They reply that the racers wouldn’t be able to hide it. David retorts that Lance rode so fast up the steep mountain that he had to use his brakes. He talks to a young rider who, according to his physiology, should be faster than Lance and who shares his own suspicions with David. Lance then seeks out this young rider and warns him off. Taking EPO has become part of Lance’s regular race time routine. Motorman delivers the drugs and the team take them in a systematic way. Lance is blasé, asking his soigneur Emma O’Reilly (Laura Donnelly) to dispose of his needles. The TV commentators confidently talk about how the riders are now clean. Lance asks Emma to cover the needle mark on his arm. When the so-called ‘vampires’, the UCI drugs testers, come to check Lance, they are duped into waiting, during which interval Lance is hooked up to a drip to dilute the presence of substances. Emma is massaging Lance when he takes a call to say that one of his tests has come back positive for testosterone. He deals with the problem by ordering a pre-dated prescription of a saddle sore cream, and then jokes that Emma knows enough to bring him down. Whilst promoting his Livestrong cancer charity, Lance recalls the moment in the hospital where he attempted to walk down the corridor but in his retelling of the story, he refuses the wheelchair. The next year, he wins the Tour again. At a book signing of his autobiography It’s Not About the Bike, Lance seems to feel uneasy around the cancer survivors that he has inspired. Dr. Ferrari is raided by the police and charged with criminal conspiracy. This news strengthens David’s case against Lance being clean as he knows that Lance had visited Ferrari before his comeback, but the doctor is notably absent in Lance’s book. David is granted an interview with Lance, but Lance turns up with Bill at his side, and in abrasive form. And still the newspaper won’t run a story by David for lack of hard evidence. Rising star Floyd Landis (Jesse Plemons) is signed to the US Postal team, and tasked with protecting Lance. Floyd comes from a Mennonite community and had to be very determined to forge a career as a cyclist against his family’s beliefs. Lance initiates Floyd into The Program and in 2002 the team are as powerful as ever and Lance triumphs yet again. By now there are more effective tests so Lance and team are also transfusing their own blood to avoid detection. In the 2003 Tour, Lance achieves his fifth win. Lance is still surreptitiously meeting Ferrari, although Ferrari has now been found guilty and banned from sports and medical practice. Cyclist Felippo Simeoni has testified against him, so Lance approaches him during the next stage and blatantly threatens to destroy him. Floyd watches on with increasing discomfort, but Lance is not to be deterred. The team have now become blasé about their doping: their bus pulls over on a Pyrenean roadside for them to hook up to drips in the midst of the cavalcade. Only Floyd is becoming increasingly uneasy. The UCI call a meeting with Lance to discuss an EPO test. The official appears anxious as he tells Lance that the test was borderline but not conclusive. Stapleton and Lance are obviously not happy but Lance seems calm, he says that he will leave it to them to do what is best for the sport. Lance prepares for a press conference anticipating the inevitable question about doping. Once on stage, he is steely eyed and defensive. He reiterates his mantra that he has never tested positive for performance enhancing drugs. David is in the room and probes Lance about the image of cycling and his association with a doctor so heavily embroiled in doping. Lance puts him down and dismisses these challenges, telling them all that they all have to fall back in love with cycling. Floyd watches on from the back of the room. Later he confronts Bruyneel about the drugs and about the untouchable Lance with his “cancer shield”. Unperturbed, Bruyneel tells Floyd that he can always leave. Betsy has now heard about David and the two of them talk. She tells him about the conversation in the hospital room, and David in turn reports this to his editor. Now David has started to attract attention. Emma contacts him and passes on all the incriminating evidence that she has. Cyclist Stephen Swart also has information to support David’s case. David has now gathered enough evidence for his editor to finally agree that he can publish his story in the newspaper, under the headline ‘LA CONFIDENTIAL’. David is invited to Texas by Bob Hamman (Dustin Hoffman), an insurer for the US Postal team who now has doubts that Lance is entitled to the $5 million bonuses that he is owed for his Tour triumphs. If Lance is cheating in races, then he is also cheating him. Lance is incensed by David’s story. He rages about Emma, who he presumes tipped David off, calling her an ’alcoholic whore‘, and gives Stapleton a series of commands – to threaten Emma, get Frankie to ‘muzzle‘ his wife, ’stonewall‘ Walsh, find out who he travels with and freeze him out, offer David’s American publisher Lance’s new book to create a conflict of interest. Lance rants that he will not be brought down. Whilst Lance brings a libel case against The Sunday Times, an arbitration case is mounted against Lance by Bob Hamman. Stapleton threatens Frankie, and Lance defames him to potential employers. At arbritration, Lance arrogantly and angrily deflects all the questions. Bruyneel warns off David’s colleagues at the Tour. The Sunday Times loses to Lance and pays out £300,000 in damages. Hamman also loses to Lance and is forced to pay out the $5 million bonus money, but he tells Stapleton that he knows Lance has lied under oath. Stapleton smirks that Lance will retire and then nothing can touch him. At what will be his final Tour’s opening press conference in 2005, Lance singles out David and insists that ‘extraordinary allegations demand extraordinary proof‘. He declares that David is taking attention away from the fight against cancer. As they leave, David is told by his colleagues that he can’t travel with them as usual. It would make life too difficult for them. The other reporters drive away, leaving David unable to follow the Tour. Lance wins his seventh consecutive Tour. The following Tour is won by Floyd, but he gets caught using testosterone. Although he denies it (unconvincingly), he is stripped of his title. Floyd returns to his community. Meanwhile Lance’s time is now spent making mindless commercials and giving corporate speeches. Lance decides that after four years, he is going to make a Tour comeback. Bruyneel tells him that it is a bad idea - he is too old, it’s vain and they have got away with it until now. But Lance won’t quit, he says he is coming back for the fight against cancer. Floyd, who is still ostracized from the sport, calls imploring Lance to have him on the team, but Lance dismisses him - sorry, you got caught. The Tour does not go well for Lance. He can’t keep pace with the new star on his team, Alberto Contador, who goes on to win, leaving him in third place. Contador then humiliates him further by telling the press that he allowed Lance his third position. Meanwhile feeling like he has no options, Floyd decides to turn himself in to the US Anti-Doping Agency’s Travis Tygart. He exposes Lance, who is finally recognized as the leader in a culture of doping. The tide is finally turning against Lance. He receives a lifetime ban from sports. He is a broken man. Lance is interviewed by Oprah Winfrey, David watches with his editor on TV. Grim faced and broken, Lance finally admits he doped in every Tour that he won. We see Lance cycle to the remote Dead Man’s Hole, and look down into the deep water. Lance tells Oprah that it was a mythic story but it wasn’t true. Lance plunges into the water hole. He cycles home, alone on an empty road. OPENS IN CINEMAS NATOINWIDE DECEMBER 9!